This is not the pristine, perfect cut of episode II, it is a condensed Nitro fueled version meant to entertain in a fast and straightforward manner. 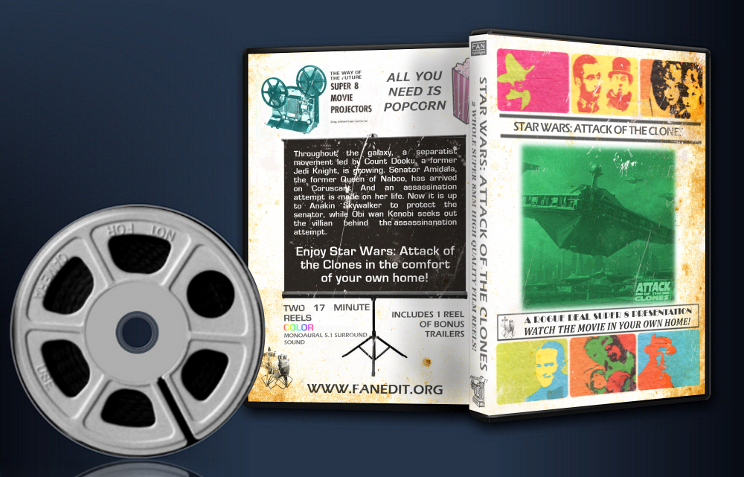 To turn Star Wars Episode II into a vintage super 8 abridged release, Spread across two 17 minute 'reels'. THIS IS A FULL SCREEN (4:3) RELEASE. This edit was inspired by the super 8 preservation Puggo created. Thank you Puggo, BionicBob, Captain Khajiit, Tv`s Frink, RemixedByJorge and everyone at fanedit.org and originaltrilogy.com. i never knew what a super 8 film was until rogue-thex started to fanedit films into this format, and i've enjoyed all the super 8 edits thus far. i'm not what you would call a die hard star wars fan i couldn't tell you anything that happens beyond the film series. wasn't a fan of the prequels but i wouldn't go as far as saying they ruined my childhood. this version cuts an awful lot that was bad regarding the original film and while i feel this effected the narrative it keeps things simple. I got to see this online. It's absolutely wonderful. I agree with the other reviewers' praise. One thing I'd like to add is that even though the hyper-paced cutting is intended to be choppy and awkward, I found most of the editing to efficiently cut through Episode II's runarounds and extended downtime. Many of the cuts--even the extreme ones--could easily be considered for a more conventional editing approach as well. I loved every moment of this edit and look forward to the complete trilogy. This was an amazing edit! A/V Quality – 10/10 – Audio was supposed to have pops and video was supposed to have grain/scratches/hair/flicker, so I can’t comment on the clarity. Editing – 10/10 –The color correction worked most of the time, although I found it annoying in scenes where ships were landing – too bright. Gorgeous job making everything look old. Narrative – 10/10 – A few sequences seemed rather rushed, but I think that’s nearly unavoidable for an edit like this. The fact that Rogue-theX was able to cut a 2 1/2 hour movie down to about a half an hour is incredible. Entertainment – 10/10 – This is easily my favorite version of AOTC, since I didn't care for the original at all. Absolutely splendid! I avoided watching too many Episode II edits while I worked on my own, and I purposefully avoided this edit as I wanted to be able to simply sit back and enjoy it. Finally this morning I sat down with my two boys and took this in. Normally I divide a review into various categories of video, audio etc.. but this is no ordinary edit. Simply put, this is just hands-down, grin-inducing fun. Is it perfect? No. And it shouldn’t be. Rogue’s vision was perfect and his execution of that vision was even better. His use of the aged look, jump-cut splicing, audio imperfections etc allowed him to make editing choices simply not possible with a traditional edit. The only comprable edit I can think of is The Man Behind the Mask’s War of the Stars. Never intended as a replacement edit, this is another example of the power and potential of fanediting as an artform. 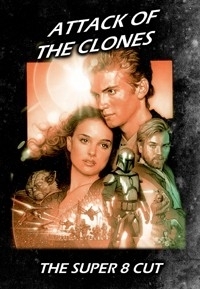 By ignoring the boundaries of creating a ‘traditional’ edit, Rogue has crafted something fun, original and FAST out of a completely pre-existing work of art (insert snicker here about referring to Attack of the Clones as art). From a story standpoint, what’s truly fascinating about this edit is that it also works as a commentary on Episode II itself. The editor himself describes the chunks of deleted footage as contributing to plot holes, however really, that is not the case. The missing footage creates some continuity errors, but really, the critical plot points of Episode II are told in roughly a half hour. While the nuance of the story only makes sense if you’ve seen the original, a first-time watcher would get the basics of the story, and that is quite a feat. So all-in-all, this is a resounding 10/10 for me. Amazing work Rogue, well-done.